Of all the potential candidates to be interviewed for manager of the New York Mets by General Sandy Alderson, only one has a detailed resume available in video form — both on DVD and via publicly accessible internet channels such as youTube and Blip.tv. 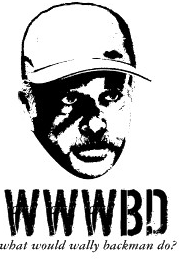 So for every person who states “I’m not sure how Wally Backman would be as a manager”, and was too lazy / cheap / ignorant to either purchase the DVD or view the free clips online (over 300 and counting), see OnTheBlack for a short playlist of vignettes showing Wally in action. buy it from Amazon ).